Take the NFPA 3000™ (PS), Recover from an Active Shooter/Hostile Event Online Training to learn how a solid, well-exercised plan is crucial to both short- and long-term recovery from incidents. Recovery from active shooter/hostile events is complex, difficult, and requires practiced coordination among a large number of participants. A solid, well-exercised recovery plan is vital to mitigating the devastating effects of these types of incidents, which are far different than natural disasters. The NFPA 3000™ (PS), Recover from an Active Shooter/Hostile Event Online Training is designed to help you understand the importance of preplanning for facility and community recovery, including hospital preparedness. Progress at your own pace to gain new knowledge and tools. 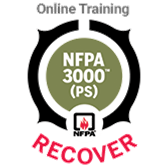 Along the way, earn the NFPA 3000™ (PS) Recover Badge. This is the final course in the 3-part NFPA 3000™ (PS), Active Shooter/Hostile Event Response; Plan, Respond, Recover Program Specialist Online Training.Through this two-hour online training, you'll improve your understanding of how to integrate and coordinate hospital preparedness as part of an Active Shooter/Hostile Event Response program and how to plan for and navigate the different phases of recovery. Complete this two-hour course and qualify for 0.2 CEUs. Upon successful completion of a course, participants will be prompted to download the CEU certificate and NFPA 3000™ (PS) “Recover" badge directly from the course site.